Smarter Healthcare, found at the intersection of technology, clinical practice, and market shifts, offers a comprehensive way to think about the dynamic forces that exist in our industry today. We examine these forces and the opportunities they create for innovation. We challenge the Iron triangle of Healthcare as a fixed framework for thinking about quality, access, and cost. Instead we advocate a fluid, more flexible model for explaining our interconnected environment. In a conceptual model of healthcare originally proposed by William Kissick, MD, there are three competing issues that enter into any dialogue on how to improve our healthcare system. 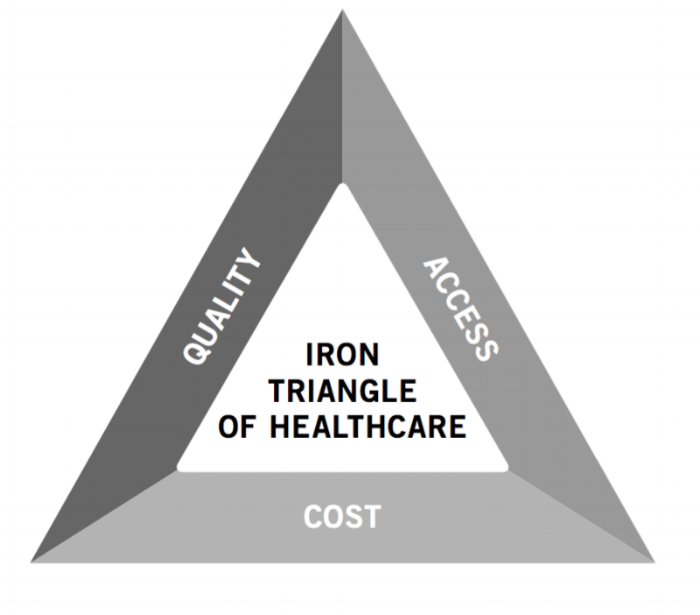 The three sides of this Iron Triangle of Healthcare are quality, access, and cost. Constant trade-offs have to be made since the classic approach to health economics dictates that you can improve any one – or perhaps even two – of these elements, but only at the expense of the third. The model states that you can advance the quality of a product or service, making it better for a higher price. Or you can create a lower cost alternative for as many people as possible, but that inevitably means that quality suffers. Each choice has its own set of sociopolitical implications that must be weighed against each other. At the time of its conceptualization, the three major stakeholders in the system defined by the Iron Triangle of Healthcare were providers, payers, and patients, with the patient arguably being the least influential. What if the iron triangle is not as rigid as we thought? Liu points out that – thanks to disruptive innovators such as Southwest Airlines and Apple – we have entered a time where computing and aviation are affordable, widely accessible, and of high quality. Based on Christensen’s model and the experiences of these industries, we can predict that healthcare will follow a similar path and indeed, break the iron triangle. In the US, more than 50 years after the introduction of Medicare, access, cost and quality have all risen, with cost seeing the largest growth. The result is an increased role and influence of the payer as the key stakeholder in the healthcare marketplace. Today, market drivers such as new biological insights, applications of innovative technologies from other industries, and the transformation of patients into consumers are creating a new healthcare landscape. The healthcare provider has a diminishing strategic role, and various forces impacting cost containment have a larger one. Smarter Healthcare, found at the intersection of technology, clinical practice, and market shifts is a comprehensive way of thinking about the dynamic forces that exist in our industry today. To advance this industry, stakeholders must engage in effective design, engagement, and deployment of solutions that address these market drivers. In our dynamic model, we approach every challenge by thinking unconventionally about these components to create new opportunities for growth, routes to market, and product offerings. This new way of approaching an interconnected healthcare environment offers tremendous opportunities for companies to innovate. It also enhances the overall healthcare system by improving outcomes for more people, lowering costs, and increasing quality. Rapid innovations and new players in the marketplace force the triangle to become more flexible and fluid. This view of the healthcare environment highlights new areas of opportunity – areas where market shifts and drivers converge to create Smarter Healthcare. Shifts in the market, technology, and clinical practice will drive cost effciencies, innovative drug-device partnerships, and increased consumer engagement. Understanding these market, technology, and clinical practice drivers will be key to understanding the new healthcare landscape. Market: Patients are behaving like consumers. they are making their expectations clear, becoming better informed and demanding quality, convenience, and price transparency. New players are entering the market with new technologies and business models. Clinical Practice: Physicians and other practitioners are incorporating new insights in biology and biomarkers, both in the treatment of disease and to maintain health. Improved analytical techniques are enhancing drug development and diagnostics on an individual and population level. Technology: New materials, micro-fluidics, computer power, electronics, and sensors are creating increasing sophistication in multiple areas of healthcare. The application of innovative technologies from other industries is continuing to accelerate how physicians serve patients. At Popper, we don’t just think about a technology or product in isolation. Our team leverages our unconventional thinking to help our clients think about opportunities. Generating ideas to solve problems is the currency of the future. At Popper and Company, we are not just trying to maximize what is – the status quo – but rather, we take an integrated view of what might be. We look for every opportunity to create value through what we call Smarter Healthcare.